In order to successfully pursue a liability claim, an injured cyclist must first prove that the driver of the motor vehicle was, to some significant extent, at fault for the incident. The legal word for fault is “negligence,” which simply means that the motorist failed to act as a reasonably careful person would act under the same or similar circumstances. Violations of the Michigan Vehicle Code, including speeding, failing to yield, and improper lane usage, are all evidence of negligence. If both the injured cyclist and the motorist were, in some way, negligent in causing the occurrence, the injured party may still recover damages, but the amount of those damages would be reduced by the percentage of the injured party’s fault. This concept is referred to as the “rule of comparative negligence.” If an injured person’s comparative negligence is greater than fifty percent (50%), they may not receive non-economic damages. [MCL 500.3135(2)(b)] Accordingly, if a cyclist fails to follow the rules of the road, he/she will not necessarily be barred from bringing a liability claim. Rather, a violation of the rules of the road or the Michigan Vehicle Code, by cyclists, are simply evidence of comparative negligence. Excess economic loss damages consist of those past, present, and future out-of-pocket expenses that are not compensable as no-fault benefits. Non-economic damages consist of those losses that affect a person’s quality of life, such as pain and suffering, incapacity, disability, loss of function, diminished social pleasure and enjoyment, scarring and disfigurement, and emotional distress. However, to recover non-economic damages, it is not enough to prove that a motorist caused a cyclist to be injured. In addition, the cyclist must establish that they have sustained a “threshold injury.” Under Michigan law, a threshold injury consists of one (1) or more of the following: (1) serious impairment of body function; (2) permanent serious disfigurement; or (3) death. Serious impairment of body function is defined as “an objectively manifested impairment of an important body function that affects the person’s general ability to lead his or her normal life.” Whether an injury constitutes a serious impairment of body function or permanent serious disfigurement is dependent upon the facts and circumstances of each individual case. As a general rule, when a person is injured due to the negligent, wrongful, or unlawful conduct of a government entity or one (1) of its employees, the law prevents a lawsuit which attempts to hold the government entity accountable for the injury. This concept is typically known as “sovereign immunity” or “governmental immunity,” and is contained in the Government Tort Liability Act, MCL 691.1401 et seq. However, the Government Tort Liability Act contains three (3) exceptions to governmental immunity, which include: (1) claims for defective highways; (2) defective public buildings; and (3) negligently driven government motor vehicles. Accordingly, if a cyclist is injured due to a government agency’s failure to adequately maintain a roadway or sidewalk, they may have a cause of action, provided the facts and circumstances of their injury fit within the highway exception to Michigan’s Governmental Immunity Act. The law allows bicyclists (as well as motorists and pedestrians) to bring a lawsuit if they are injured due to the government agency’s failure to repair and maintain the roadway. However, the law limits state and county highway agencies’ duty to “the improved portion of the highway designed for vehicular travel and does not include sidewalks, trail ways, crosswalks, or any other installation outside of the approved portion of the highway designed for vehicular travel.” In other words, a cyclist may be entitled to compensation from a county or the State for its failure to maintain the surface of a roadway if he/she is riding in a lane that is also available for motor vehicle travel. However, if the same cyclist is traveling on a bike path or shoulder adjoining a highway which is not in reasonable repair, the law does not allow him/her to be compensated by the State or county. Additionally, the Government Tort Liability Act does not impose a duty on state and county road commissions for a defective or dangerous design, negligence due to the posting of signs, or negligent maintenance of traffic control devices. Rather, liability only extends to a failure to maintain the roadway surface designed for vehicular travel. Finally, an injured person must serve notice on the governmental agency of the exact location and nature of the defect, the injury sustained, and the names of any known witnesses to the occurrence within one hundred twenty (120) days from the time the injury occurred. The notice may be served upon any individual, either personally or by certified mail, return receipt requested, who may be lawfully served with civil process directly against the governmental agency. In the case of the State, the notice shall be filed in triplicate with the Clerk of the Court of Claims. Different deadlines may apply to the notice provisions and time limitations for minors and individuals deemed physically disabled or incapable of giving notice. When a cyclist is injured as the result of a defective or dangerous condition that is part of a private parking lot, he/she may have a claim against the possessor of the property/parking lot. This type of claim is typically referred to as a negligence or premises liability claim. In order to successfully pursue a premises liability claim, an injured person must establish that the: (1) property owner owed the injured person a legal duty; (2) property owner was negligent and/or breached his/her duty; (3) injury caused the injured person to suffer damages; and (4) property owner’s negligence was a proximate cause of the person’s injuries. Michigan courts have adopted a legal doctrine typically known as the “open and obvious defense,” which plays a major role in most premises liability claims. Essentially, this legal doctrine states that if a dangerous or defective condition is so open and obvious that a reasonable person would take care to avoid it, then the possessor of the property does not owe a duty of reasonable care to the injured party and the injured party is barred from bringing a claim for his/her injuries. 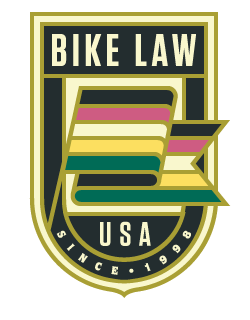 If an injury is caused by a defective bicycle or product, the injured person may be entitled to recover under a legal theory typically referred to as product liability. Typically, product liability claims allege that a product was negligently manufactured or designed. Product liability claims may also be brought under a theory that the manufacturer or seller of a product breached an express or implied warranty. An express warranty is a representation or statement made by a manufacturer or seller that the product has certain characteristics or will meet certain standards. An implied warranty is a duty imposed by law which requires the manufacturer’s product to be reasonably fit for the purposes and uses for which it is intended or uses which are reasonably foreseeable by the manufacturer. Claims alleging an injury due to the negligence or wrongful conduct of the promoter of a race or organized ride are extremely difficult under Michigan law. Almost all races and organized rides require a signed release as a condition of participation in the event. Michigan courts have consistently held that a release is enforceable and a complete defense for damages caused by ordinary negligence. However, courts have held that claims may be pursued, even when a release is signed, if the injury is caused by gross negligence or willful and wanton misconduct, or when the injury arises from an unreasonably dangerous condition that is not associated with a risk inherent in the sport. Pursuant to MCL 700.5109, a parent or guardian of a minor may release a person from liability for personal injury sustained by the minor during a specific recreational activity. Additionally, a participant in a race or organized ride may be injured due to the wrongful conduct of another racer or participant. However, Michigan courts recognize that participants in these types of activities assume certain risks when they agree to participate in sports or recreational activities. Accordingly, in order to succeed in a claim against another participant in a sporting event, it must be established that the wrongdoer acted recklessly. Mere negligence on the part of the wrongdoer is not enough to establish a successful claim. Landowners and those that possess land can be held liable for injuries caused by their negligence or wrongful conduct. However, the Michigan Recreational Land Use Act (MCL 324.73301) bars a claim for injuries to a person who is on the land of another without paying the owner, tenant, or lessee of the land a valuable consideration for the purpose of any outdoor recreational use or trail use, with or without permission, unless the injuries were caused by gross negligence or willful and wanton misconduct of the owner, tenant, or lessee. If a cyclist is injured as the result of a domestic or farm animal, he/she may have a claim against the animal’s owner. Dogs are the animals most likely to injure a cyclist. In Michigan, a dog owner is strictly liable for damages caused to a person bitten by his/her dog. The only exceptions to this rule are if the injured person provoked the dog or was bitten while trespassing at the time of the bite. A landlord may also be held liable for injuries caused by a bite inflicted by a tenant’s dog, if the landlord is aware of the dog’s vicious nature.